I'm a sucker for beautiful needles. I know, they're just NEEDLES - just what you need to get a job done. But they're not. 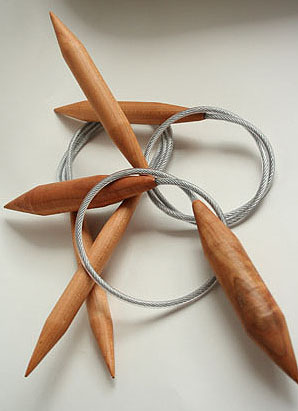 Especially these - beautiful Maple Circulars with SERIOUS cables. Each one handmade by woodworking artisan Ed Jenkins, these fantastic JUMBO wooden circulars were what I'd been searching for! Now I can do an afghan in TWINKLE, or in all of the beautiful BULKIEST yarns I love - cuz these needles and cables can handle it. Beautiful to hold, with just enough traction to keep even the slipperiest yarns on the needles, these are great for hats, shawls, afghans. (Please note, many sizes are sold out on these, and Jenkins is no longer producing these needles - we will have replacements in rosewood, ebony and in Birch as well towards the end of October - Please friend us on facebook or twitter where we will be announcing their arrival! NOTE: JENKINS are NO LONGER BEING PRODUCED - we have VERY FEW LEFT - please visit our SURINA JUMBO PAGE for our new, fabulous jumbo surina circulars wooden needles in sizes 19-50 in lengths up to 60"